Sunset Paddle on Lake Tugaloo. Photo courtesy of Alexa Lampasona. Rabun County is blessed with an abundance of beauty and interest. The pastoral and relative isolation of the area until the 1950s has preserved many historic sites and practices. The botanic and geologic richness of the area have come together to create an enormously interesting place to be outdoors. The beauty of it all plays to all the senses. Having three State Parks within the county indicates why preservationists have worked to protect and preserve the unique qualities of each park. As you visit on the Park Around tours or just spend the day hiking one park, know that you are enjoying one of the most bio diverse areas in the world. Markers, maps and displays will highlight some of the elements you will see and your own discoveries will make memories for years to come. Moccasin Creek State Park - Moccasin Creek State Park is located on the shores of beautiful Lake Burton in west Rabun County, it is easily accessible and features camping, boat dock/ramp, fishing pier, hiking trails, picnic shelters and a playground. This state park is only 32 acres but is one of the best camping locations in the state of Georgia. The park was founded in 1963 as a campground but was originally managed by the nearby Burton Fish Hatchery. After the popularity rose for the park the staff at the hatchery came to accept that it was too busy for them to manage and was then turned into a state park. In 1966 the park was renamed the Moccasin Creek State Park and began to be managed by the Department of Natural Resources. To get to the park you travel along scenic highway 197. Some will say that this is one of the most beautiful drives in all of the Northeast Georgia Mountains. It is famed as The Old Moonshine Highway; this scenic highway today features one of a kind art shops, dining, fields of flowers and, native plants, trout fishing, and a peaceful feeling as you meander the famed Old Moonshine Highway. For more information about Moccasin Creek State Park visit their website. Black Rock Mountain State Park - Black Rock Mountain State Park is Georgia’s highest state park. The park, at an altitude of 3,640 feet, is located astride the Eastern Continental Divide and features numerous scenic overlooks, hiking trails, cabins, cottages, campground, a playground, picnic shelters, a seventeen-acre fishing lake, gift shop, and visitors center. While you are exploring this beautiful state park, take advantage of the gorgeous views. On a clear day you can see 4 states; Georgia, North Carolina, South Carolina, and Tennessee. There are 5 different hiking trails through lush forest. You will see flowing streams and come across the 17 acre Black Rock Lake. This state park was created in 1952 with an original 1,000 acres. John V. Arrendale, a Rabun County native, began pulling together what is now the state park by purchasing 70-acres in 1938 long before the park was designated by the state. There have been many more purchases to add to the Park including 301 acres in 1995 with the funding from the Preservation 2000 land acquisition program under the leadership of then Governor Zell Miller. There have been several smaller additions of acreage to the southwest corner of the park to bring it where it is today. For more information on Black Rock Mountain State Park please visit their website. Tallulah Gorge State Park - Tallulah Gorge State Park is located along US Highway 441; it is a 2,689 acre park surrounding the 1,000 foot deep Tallulah Gorge. The park offers camping, lake/beach swimming, fishing, rock climbing, hiking and viewing spectacular waterfalls. The Jane Hurt Yarn Interpretive Center features comprehensive displays on the history, wildlife, terrain and fragile ecosystem of Tallulah Gorge and the surrounding area. The county line that divides Rabun County and neighboring Habersham County cuts through the state park. The park was established in 1993 but had been a topic of discussion since 1905 to make it a state park around the gorge. Governor Zell Miller was a driving force in the creation of the park as he was an avid outdoorsman. The Tallulah Gorge is a 1,000+ steep gorge that was formed due to the Tallulah River cutting through the rock which runs through the gorge floor. There are also six waterfalls within the park that draw people to want to hike around, down, and through the park. There 100 passes handed out each day for visitors to go to the gorge floor. Georgia Power operates a hydroelectric dam that is upstream of the gorge. The flow of water through the gorge is at a lower level than its historical flow. Georgia Power have schedule water releases throughout the year that increases the flow to its raging history. Many kayakers will get permission to run the gorge to the excitement and thrill of onlookers. The intensity and beauty of the Tallulah Gorge has been drawing tourist and visitors to Rabun County for years. For more information on the Tallulah Gorge State Park please visit their website. The three parks offer great views, rare flora and fauna, diverse sporting opportunities and great family experiences. If water is your favorite element, you’ve arrived at the right place. Five scenic mountain lakes flow one into the other. Owned by Georgia Power, each lake offers r swimming, fishing and boating. Nearby areas provide attractive venues for picnicking, biking, camping, and hiking. Lake Burton – The first in the five lake series of the Tallulah River Watershed is a 2,775 acre lake with sixty two miles of shoreline. The public Burton Beach is on N. Charlie Mountain Road. Lake Seed – Lake Seed is a 240 acre lake with thirteen miles of shoreline. The public beach is on Crow Creek Road. Lake Rabun – A meandering 835-acre quaint mountain lake with twenty five miles of shoreline populated with homes, shops and the Lake Rabun Hotel. The lake community is celebrating its 100th anniversary this June. Lake Rabun Beach is on Lake Rabun Road adjacent to the USFS Lake Rabun Campground. 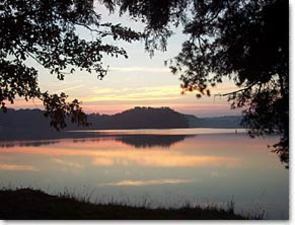 Lake Tugaloo – is a remote 596-acre lake with eighteen miles of shoreline. The lake is actually located in two counties, Rabun and Habersham, and in two states as it also occupies real estate in Oconee County, SC. Tallulah Lake – Tiny Tallulah Lake is the smallest gem of Georgia Power’s reservoirs, covering only 63 acres with 3.6 miles of shoreline. It is part of Tallulah Gorge State Park. The public beach is off of Highway 441. 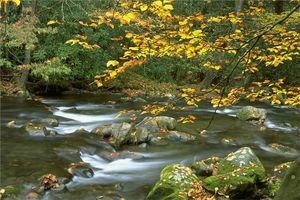 The Chattooga River – One of the few remaining free-flowing streams in the Southeast, it was designated by the U.S. Congress in 1974 as a Wild and Scenic River for its outstanding scenery, recreation and wildlife, as well as its geologic and cultural values. Floaters, hikers, and trout fishermen enjoy this protected river corridor. Renowned for intense whitewater, it calls thousands of white water rafters annually. Becky Branch Falls – An easily accessible falls, just minutes from Clayton. Drive east on Warwoman road until you reach the Warwoman Dell Recreational Area, on the right, where the trail begins. The 1.4mile hike is steep at times. Bull Sluice – Many call it a waterfall. Kayakers call it a rapid…a Class V rapid! From Clayton, take Hwy 86 east to the SC line. Park on the SC side of the bridge and follow a paved path to the parking area. At a sharp left turn in the path, continue straight. Bull Sluice is ¼ mile ahead and a perfect place to watch rafters and kayakers shoot the rapids. Darnell Falls – This waterfall is an energetic 30’ cascade that is very easy to reach and view in Rabun Gap, GA.
Hemlock Falls – A wonderful 15’ waterfall on a trail across from Moccasin Creek State Park. The 1 ¼ mile trail to the waterfall is very scenic and relatively flat. From Clayton, take Hwy 76 West to GA 197 South. Continue to the entrance to Moccasin Creek State Park on your left. Turn right and follow the signs. Holcomb Creek Falls and Ammons Creek Falls – Located in the Chattahoochee National Forest. From Clayton, head east on Warwoman Road about ten miles and turn left onto Hale Ridge Road. Continue nine miles to Overflow Road. This is a moderately strenuous 1/3 mile hike to 120’ Holcomb Creek Falls; 1.4 mile further to Ammons Creek Falls. Hurricane Falls – Located at Tallulah Gorge State Park it is the largest of 6 waterfalls in the park. Hurricane Falls is a dramatic 96’ drop to the floor of the Gorge. 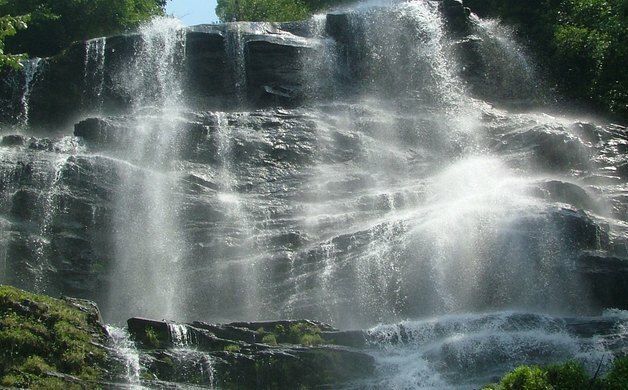 Minnehaha Falls – Located south of Lake Rabun. To get there, head south on Old 441 to Lake Rabun Road. Turn right and head around the lake. Turn left about one mile past the Rabun Beach Recreational Area, crossing Seed Lake Dam and following Bear Gap Road for 1 ½ miles. Hike Fall Branch trail ½ mile to the 100’ falls. Mud Creek Falls – These falls have a vertical drop of 100’. You do not have to hike to these falls. What a great place for a picnic. There is hiking at the base of the falls along the stream. The falls are located in Sky Valley, Georgia. Panther Falls and Angel Falls – Panther is the first waterfall you will come to and Angel is about 1/3 of a mile further (and worth the extra hike). The trailhead is in the Rabun Beach Recreational Area. With all the choices for outdoor adventure, it is easy to see why Rabun County is The Natural Choice.